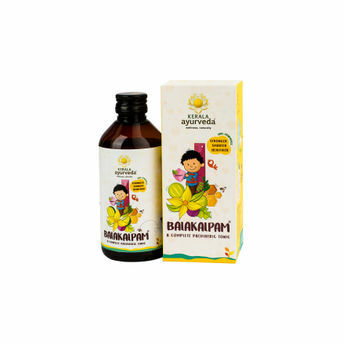 Balakalpam is a safe, non-addictive and complete Herbal Tonic for Children. A wonderful Ayurvedic Herbal solution it is specially designed to provide relief from common infantile problems such as abdominal pain, colic spasm, regurgitation, constipation, fever, cold, worms and diarrhea. Provides liver care Uses - It is specially designed to provide relief from common infantile problems such as abdominal pain, colic spasm, regurgitation, constipation, fever, cold, worms and diarrhea.